Accroche Note proposes a variety of monographic programmes; the list below is not however exhaustive but merely illustrates the amplitude of the ensembles repertoire. Forbidden Voices, the new song cycle by Ahmed Essyad, expresses simultaneously that which is kept secret, that which cannot be said, and that which is forgotten but later awakened by consciousness. This work of variable instrumental formation is inspired by Sufism, the mystical dimension of Islam, drawing notably upon texts by Al-Hallaj (857-922). 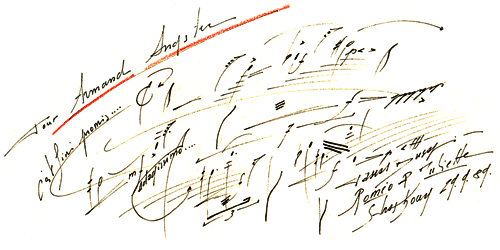 As in many of the composers works, the voice, used in the context of a given language, serves as the basis for the musical gesture. Olivier Grief’s, both Polish Jews who had survived the Holocaust, were natives of the region of Galizia during a time when its borders were constantly changing. His music is greatly influenced by this heritage. Inspired by multiple literary sources, L’Office des Naufragés is a song of overwhelming intensity. In the omnipresent shadow of death, the voice of serenity is like a light of hope. The idea here is to satisfy the curiosity of the public, who sometimes question the meaning and reason of musical trends, and mix works by artists who have become friends and with those of the composers who inspired them. This series of concerts allows Accroche Note to create programmes which are not usually possible due to the fact that contemporary music is usually not ‘mixed‘ with other genres. These “crossed portraits” create a link between today’s music and that of the past.